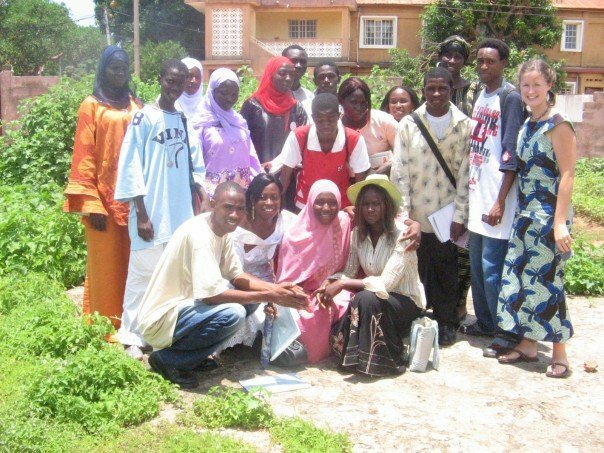 Team Love4Gambia is pleased to bring you the story of Melanie Connors, a long time NSGA volunteer and veteran of one of our longest running Gambia-based summer school programs. Melanie is also our fearless Blue Nose team captain! As approach race day, we will continue to profile one to two of our runners and walkers each week for you, proudly showing off what makes our volunteers like Melanie tick, what makes them tie their laces and head out the door, what makes them show up for us. EP: How did you become involved with the NSGA? Melanie Connors: I became involved with the NSGA in 2007 when I volunteered to teach as a part of the Peer Health Education Summer School in The Gambia. It was an incredible experience through which I learned firsthand how important the NSGA’s work is in The Gambia. EP: Did you run in The Gambia? MC: I attempted to run in The Gambia once…. when I was there, I lived with Erin Poirier. She was up and running the beaches pretty much every morning. It is hard to resist Erin’s motivation, so I eventually joined her on a run. It was the hottest and most unbearable run of my life! I overheat while running during a Nova Scotian summer’s day so attempting to run on a hot Gambian morning was not my best decision. I never attempted again! MC: When I run for Team Love4gambia, I think of the students that I taught when I was in The Gambia. The programs that the NSGA provides for youth are so important and would not be possible without our generous sponsors. I run for Team Love4Gambia to bring awareness to the NSGA and the important work they do for Gambian youth. When thinking about what Erin accomplished last summer and what Andrea will be doing this summer, I feel that running for Team Love4Gambia is the least that I can do. It seems so small in comparison to 430 HOT kilometers! EP: You ran your first marathon as part of Team Love4Gambia last year. Can you share a highlight of your race? MC: I set out to run my first marathon last year not knowing what to expect. I ran up to 34 km in my training (and thought that was crazy!) and then I was setting out to run 42.2! It felt completely insane. Around kilometer 39 is when the full marathoners face the incredibly steep Maple Street in Dartmouth. It feels like a cruel joke when you are looking up it from the bottom on the most tired legs you’ve ever had. I slowly made my way up it, thinking that if I made it to the top, maybe I could just stop right there and go home to bed. When I reached the top there was a spectator who was in tears watching all of us come up the hill. She told me how inspirational it was to watch us each reach the top. At that moment I knew that I could make it to the finish line. I made it to the top of Maple Street, another 3 km or so wouldn’t be so bad. MC: This year I have decided to run the half marathon. When I started training it struck me how much less I have to run compared to training for a full marathon. Half-marathon training is much more manageable and less daunting than that of a full. When I set out for some of the longest runs last year, it takes the entire day to prepare (eat properly, wait the right amount of time, then the run which took multiple hours, then stretching, eating, showering and by the time I’m done, I am too exhausted to do anything else that day!). At least my long runs this year only take up a part of the day! MC: Suiting up for winter running is my biggest challenge. I hate finding all of the pieces and putting on the layers. When heading out on a winter run, it is the dressing that I least look forward to, not the run itself. Once I am actually out the door there is no problem! I would much rather run on a cold winter’s day than in the heat (as I mentioned earlier!!). Luckily it is now April so I need to put on less and less layers before heading out the door! Soon it will be time for shorts! MC: I love that moment in my training when I notice that I have gotten stronger. When I think to myself, “Are those really my legs beneath me?” Then you know that the hard work is starting to pay off. MC: Chocolate milk! I always indulge in a glass of chocolate milk when I finish a run. I find that when I am in the last 2-3 kms of any run (they are always the hardest kilometers), I think about the chocolate milk waiting for me at the end and I am able to power through! MC: I love the feeling in Halifax during the Bluenose race weekend. There is a buzz in the air because everyone is pumped up and excited about running. I look forward to it every year. I love celebrating everyone’s successes as they cross the finish line too! This year we will be celebrating the successes of everyone on Team Love4Gambia! EP: What advice would you give to new runners to assist them in their training for the Blue Nose Marathon? MC: Don’t be afraid to take your long runs nice and slow. When I first started running, I started out VERY slowly. I would have never been able to reach my target distances if I didn’t keep a nice slow pace on my long runs. I would also recommend truly using your rest day after a long run to really rest your muscles. Don’t do anything strenuous that day and enjoy it because you earned it! EP: Thanks Mel! Your post-Blue Nose Chocolate milk will be well deserved! Your leadership and team captain work has made the fundraising total you see on our team page possible. To wish Melanie luck and support, you can donate to this run by clicking here. To join Melanie and team Love4Gambia, check out our team page here. This entry was posted in Running for Charity and tagged Blue Nose Marathon, Charity Team, inspiration, Melanie Connors, Nova Scotia-Gambia Association, Runner, The Gambia. Bookmark the permalink.